The subject of the hereditary hyperglycemic syndromes occurring in laboratory rodents and of their potential usefulness as “models” for the study of human diabetes has received much attention in recent years. Thus, at least three entire workshops and several extensive reviews were devoted to this topic during the last few years (1,2,9,14,15,17,20). For this reason, the present discussion will be limited to a brief review of current knowledge concerning the genetic transmission of some of the animal syndromes and to a description of their clinical course and of insulin-secretory patterns and pancreatic anomalies apparently characteristic for some of them. 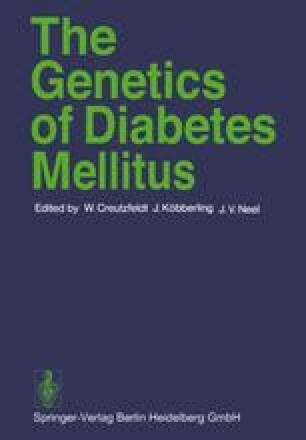 Finally, these observations will be related to more recent findings suggesting that such apparent pancreatic anomalies need not to be the primary hereditary defect responsible for the occurrence of the syndrome but that they may merely represent a characteristic feature of the genetic background of the animal carrying the “diabetogenic” gene (9,12).